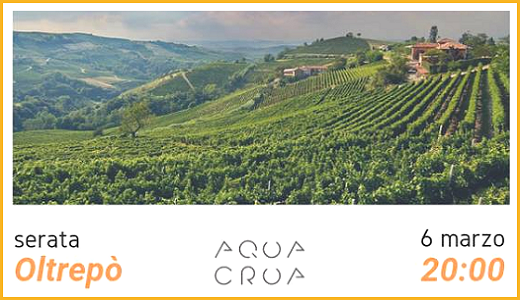 We are pleased to invite you in Barbarano Vicentino (VI) to a special Oltrepò Pavese tasting organised by Michelin-starred restaurant Aqua Crua on Wednesday, March 6th 2019. The tasting, led by Andrea Picchioni and Fabio Marazzi with the help of resident sommelier Paolo Rancati, will feature 3 wines by our winery and 3 wines by Scuropasso winery. Chef Giuliano Baldessari will provide some creative food pairings. The tasting is limited to 16 people. Information and reservations: +39.0444.776096 or info@aquacrua.it.